A historic fire look-out tops the boulder garden at the summit of Granite Mountain. Granite Mountain Trail, October 09, 2009. With nearly its top third above the treeline, Granite Mountain offers an alpine experience without travelling too far or climbing too high. Its trail climbs steeply through several distinct montane layers, graduating from leafy, mixed forest to diminishing coniferous woodland, stone-strewn meadows carpeted with shrubs and wildflowers, and finally, a boulder-heaped summit topped by a ranger lookout with views of Mt. Rainier and numerous other surrounding peaks. The mountain’s vast blueberry meadows offer double treats each year: first the luscious fruits of mid- to late summer and then the fiery foliage of autumn. From the summit and various points along the trail, Interstate 90 can also be seen — and heard — snaking its way up the South Fork Snoqualmie River Valley below. Given its many attributes and easy access, one should expect to encounter other hikers along this popular trail. The 8.60-mile/13.80-km round-trip trail shares a trailhead with the trail to Pratt Lake. At one mile/1.60 km from the trailhead, the trails diverge, the path up Granite Mountain veering steeply to the right. Along the way, it crisscrosses the mountain’s winter avalanche chute — hikers are warned to avoid the trail when snow is present, as avalanches here have proven deadly. The trail begins beneath a soaring woodland canopy upheld by slender conifer columns and laced here and there with delicately arching branches of vine maple (Acer circinatum). Watch as the rigors of increasing elevation stunt the forest until it gives way to stony alpine meadows at the summit. Granite Mountain Trail, September 17, 2017. The trail crisscrosses Granite Mountain’s winter avalanche chute for much of its distance. 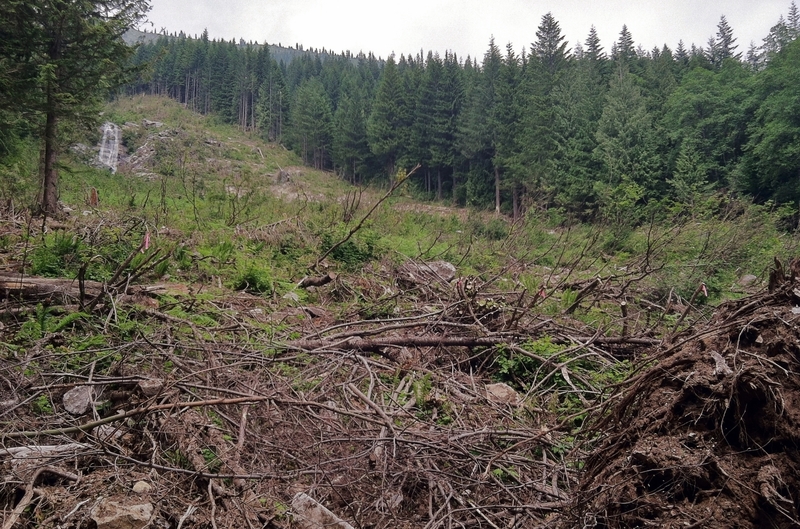 Seen here from the Pratt Lake Trail just before its junction with the Granite Mountain Trail, the debris-strewn swath is testament to the destructive power of a mountaintop’s snowpack funneled down a steep ravine. Because past avalanches on Granite Mountain have had deadly consequences, hikers and snowshoers are advised not to use the Granite Mountain Trail between November and May or when snow is visible in the chute. (The Pratt Lake Trail enters the chute only briefly at the end of one switchback before veering back into forest.) Pratt Lake Trail, July 14, 2012. At approximately 2.50 miles/4.00 km from the trailhead, the trail breaks out of forest and into the mountain’s alpine meadows, where trees dwindle in number and size and views reach to far-off peaks. On clear days, Mt. Rainier dominates the southern view. Here, fiery autumn leaves of Sitka, or western, mountain ash (Sorbus sitchensis) and Cascade blueberry (Vaccinium deliciosum) frame the mountain’s cool, contrasting blue. Granite Mountain Trail, October 05, 2014. In summer, wildflowers dot the open air along the avalanche chute and above the treeline, including torch-like scarlet paintbrushes (Castilleja miniata) (top left), woodland beardtongues (Nothochelone nemorosa) gaping at passersby (top right), Columbia lilies (Columbianum lilium) dangling from the trailside (lower right), and finely fringed asters (here, likely a giant mountain aster, Canadanthus modestus) (lower left). Granite Mountain Trail, August 29, 2014 and June 12, 2016. As the trail climbs the mountain’s alpine steeps, it rounds and quickly overlooks a marshy tarn. Keechelus Lake glimmers in the eastern distance. Granite Mountain Trail, October 05, 2014. Beyond the tarn, the trail climbs to a relatively flat meadow just below the summit, where the mountain’s namesake boulders create a sort of “rock garden of the gods.” Here, the trail passes through segments of column-like stones that lie where they toppled. Granite Mountain Trail, October 05, 2014. A matted mosaic of heaths (Phyllodoce empetriformis) and blueberries (Vaccinium sp.) hugs the rock garden’s scattered stones and tinges the mountaintop with vibrant hues throughout the summer and autumn. Beyond, Kaleetan Peak and Chair Peak rise on the northern horizon. Granite Mountain Trail, October 09, 2009. Granite Mountain’s signature blueberries (Vaccinium sp.) (upper and lower left) mingle with pink mountain-heath (Phyllodoce empetriformis) (right) throughout the alpine meadow and rock garden to provide a combination of treats for the sight and taste. 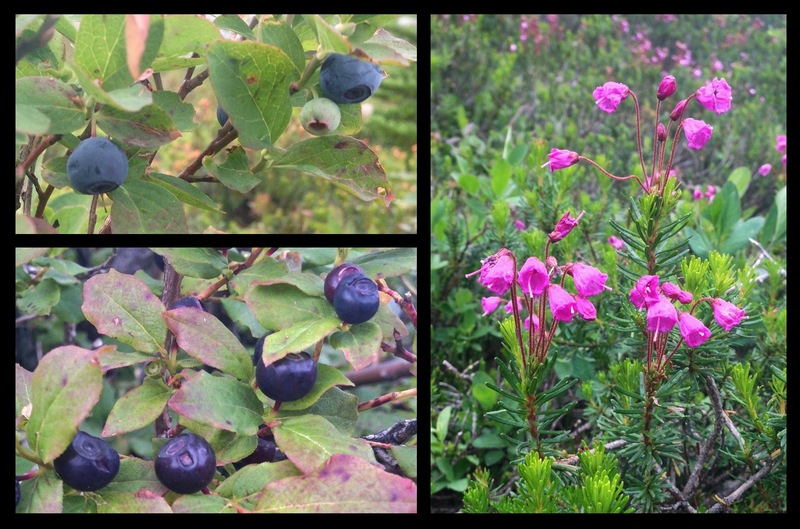 The primary blueberry species on the mountain is the Cascade blueberry (V. deliciosum) (top left), which bears downward facing, powder-coated, true blue berries that are almost hidden by its leaves. Similar looking and equally tasty blueberry cousins are also present, including the tall, or, black huckleberry (V. membranaceum) (lower left), which is distinguished by its purple-hued berries that lack a powdery coating and are borne upward and outward above its leaves. Throughout summer, drifts of heath bloom in shades of pink; in autumn, the blueberries continue the display with foliage ranging from smokey purple to blazing red. Granite Mountain Trail, August 29, 2014. Keep and eye — and ear — out for the marmots that sun themselves atop the rock garden’s boulders. Marmots are ground squirrels that can reach sizes larger than domestic cats. Their distinctive, high-pitched calls sound much like humans whistling through their teeth and often announce their presence long before they are seen. The marmot in this photo is likely a hoary marmot (Marmota caligata). Granite Mountain Trail, September 10, 2017. Above the rock garden (here, on the left), a bouldered ridge leads directly to the summit. Some hikers prefer to scramble up the ridge rather than take the more roundabout trail below. Granite Mountain Trail, August 29, 2014. As the trail nears the summit, Crystal and Upper Tuscohatchie lakes come into view far below. Between the two larger lakes, Cad Lake is barely visible to the right of the tree in the center foreground. The lakes are part of a clutch of lakes collectively called Granite Mountain Lakes (but not to be confused with the nearby Granite Lakes). Granite Mountain Trail, August 29, 2014. On the trail’s final ascent, views open in every direction. From left to right, the northeastern view encompasses Crystal and Upper Tuscohatchie lakes and an array of peaks, including Kaleetan Peak, Chair Peak, Bryant Peak, Hemlock Peak, The Tooth, Denny Mountain, Mount Thompson, Chikamin Peak, and Four Brothers. Granite Mountain Trail, October 05, 2014. 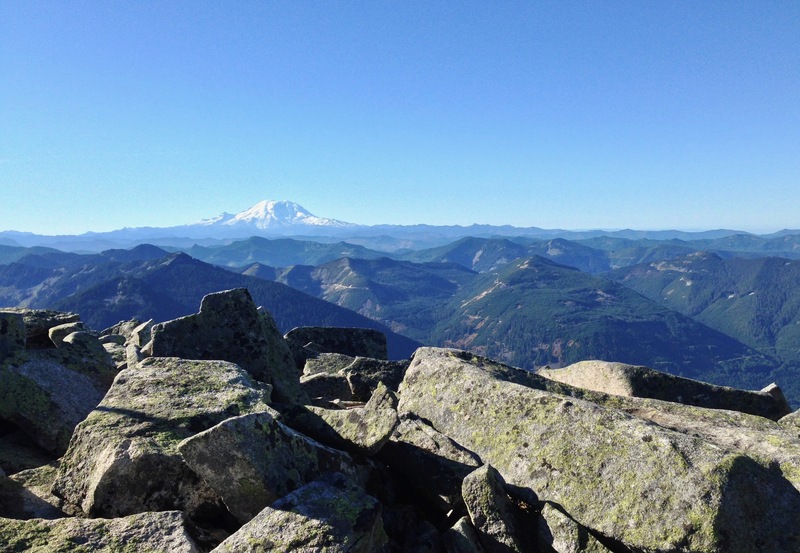 From Granite Mountain’s jumbled stones, the view skims a crinkled landscape topped by Mt. Rainier on the southern horizon. Granite Mountain Trail, October 05, 2014. Granite Mountain’s final destination is the 1955 fire lookout on its summit. The foundation of the first 1924 lookout is still visible a little east of the current one (here, in the foreground). Granite Mountain Trail, August 29, 2014. The lookout is still staffed and maintained on occasion by volunteer rangers who open it to hikers. Granite Mountain Trail, August 29, 2014. Winter’s sunset tinges Granite Mountain in this view from the Annette Lake Trail. The mountain’s funnel-like avalanche chute is clearly visible plunging into the forest below the summit. (The Annette Lake Trail itself is raked by avalanches that descend several chutes along the slopes of Silver Peak. When entering alpine and subalpine elevations in winter, always know the terrain and avalanche forecasts.) Annette Lake Trail, December 29, 2013.